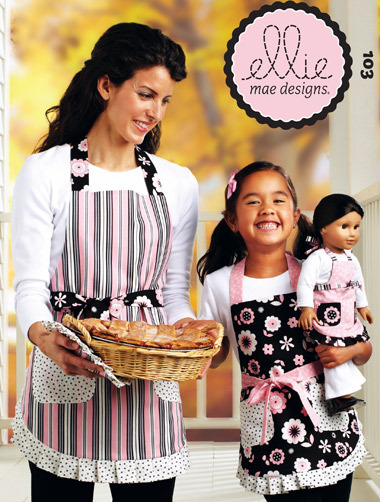 These adorable coordinating aprons and pot holders offer three sizes for Misses and Girls and one size for an 18" (45 cm) doll. The aprons are made using three fabric choices and are reversible. The aprons have patch pockets on one side, a pleated ruffle at the outer edge, and neck and waist ties. The waist ties wrap around the waist and tie in the front. The round pot holders have a pleated ruffle at the outer edge and a loop for hanging.